1969: On Jan. 1, 1969 the scene was a sellout crowd at the Civic with the main event of ED FRANCIS coming out of retirement to face RIPPER COLLINS. Back in Nov 1968 on KGMB tv FRANCIS pushed COLLINS down on the ground during locker-room interviews after COLLINS continued to poke his finger in FRANCIS's chest. For months COLLINS demanded a apology from FRANCIS or a wrestling match. FRANCIS used a back drop to pin COLLINS in their one fall match. The two would meet three weeks later at the Honolulu INternational Center in a wire cage match with COLINS winning the match. ON Jan. 12, 1969 tragedy stuck wrestling fans in Hawaii when JIM HADY died of a heart attack following a wrestling match at Schofield Barracks. HADY was involved in a Six man Tag Match with partners LORD BLEARS and TEX MCKENZIE vs. RIPPER COLLINS, FRIDAY ALLMAN and GRAHAM. HADY complained of pains in his stomach during and after the match. He showered, drove home, and collapsed later in his home in Pearl City. He was taken by ambulance to Leeward Hospital where he was pronounced dead at 11:45 pm. Three days later on Jan 15th at the Civic Auditorium's weekly card, all proceeds from the card were turned over to HADY's wife. The HIC's outdoor billboard on the corner of Ward Avenue and Kapiolani Boulevard in December 1969. Also at the start of the year, JOHNNY BAREND who had been a main event headliner for the past three years failed to show up to defend his Hawaiian Title against NICK BOCKWINKEL. As a result of this BAREND was forced to give up his title and suspends from wrestling in Hawaii. In February CURTIS IAUKEA returned from a World Tour and captured the Hawaiian title from BOCKWINKEL. By the end of the year IAUKEA will capture all three tiles held in Hawaii: the Hawaiian title, the North American title and the tag team title. In April 69, FRANCIS brings in PEDRO MORALES who becomes a fan favorite, MORALES will battle IAUKEA on main event through out most of the year. Fans are also treated to wrestlers GORILLA MONSOON, BILLY ROBINSON, and former world champion GENE KINISKI on a regular basis. BILLY WHITE WOLF and THE MISSING LINK return also. On Oct. 15. 1969 the ED FRANCIS/RIPPER COLLINS feud boils over into a final non-sanctioned fight to the finish. The match ends with FRANCIS taking his belt off and beating COLLINS out-cold. Because of this COLLINS will use the term "I will never forget the whip" for years to come on his locker room interviews. By the end of year the FRANCIS-COLLINS feud again heats up when COLLINS attacks FRANCIS son BILLY FRANCIS on KGMB-TV. On the Christmas day card at the Honolulu International Center BILLY FRANCIS makes his pro-wrestling start. The Father and Son team defeat COLLINS and his man FRIDAY ALLMAN before a sellout crowd. In December 69, IAUKEA leaves on another tour and JOHNNY BAREND returns to action in Hawaii. BAREND starts feuding with PEDRO MORALES and captures MORALES's North American title. BAREND also replaces IAUKEA as COLLINS' partner for the Hawaiian tag title and the two become an unbeaten team again. In 1970 the main feud will be BAREND-MORALES in various matches through-out the year. By August 70 MORALES will capture his NORTH AMERICAN title back from BAREND only to lose the title to the MASKED Destroyer in Sept. 69. After that MORALES will leave Hawaii and wrestle on the east coat and in 71 become the WWWE World Champion. In April 70 BAREND teams with THE SHEIK to battle RAY STEVENS and PETER MAIVIA for the world tag team championship. BAREND and SHEIK are disqualified and start fighting with each other. The two will battle in a series of grudge matches before sellout crowds at the Honolulu International Center. By the end of the year BAREND will also break up with RIPPER COLLINS and the two battle each other. ON December 9th of 1970 in a steel cage catch COLLINS and IAUKEA WHO RETURNS TO Hawaii shave BAREND's hair and BAREND will leave Hawaii for another year. SAM STEAMBOAT returns to Hawaii and will wrestle here till his retirement. STEAMBOAT battles RIPPER COLLINS through most of the year for COLLINS's Hawaiian Championship. The title will exchange hands between the two through the year. 1971 saw the arrival of MADDOG MAYNE who teams up with RIPPER COLLINS to capture the Hawaiian tag team championship. The two will hold the title till July 71 and lose their titles to SAM STEAMBOAT and BEARCAT WRIGHT. Both COLLINS and MAYNE start feuding with each other. IN August 71 COLLINS loses his Hawaiian title in a "loser leave Town match" to MAYNE, forcing COLLINS to leave Hawaii. On Jan. 1, 1971 DON MURACO makes his professional wrestling start in Hawaii losing to CURTIS IAUKEA. Monaco will wrestle as a fan favorite till June, before going on tour on the mainland. 1971 also saw the arrival of BEARCAT WRIGHT and SWEET DADDY SIKI as regulars in Hawaii. BEARCAT will battle MADDOG MAYNE through most of the year. On Sept. 8th of 71 the two do battle in the main event at the Honolulu INternational Center in "Loser gets painted Black or White in the Ring head to toe". BEARCAT wins the match and paints MAYNE black from head to toe. 1971 also saw the professional wrestling start of JIMMY SUPERFLY SNUKA in NOV. 71. JOHNNY BAREND also returns to action in Hawaii in Dec. 71 as a fan favorite. He captures the North American Title from SWEET DADDY SIKI. 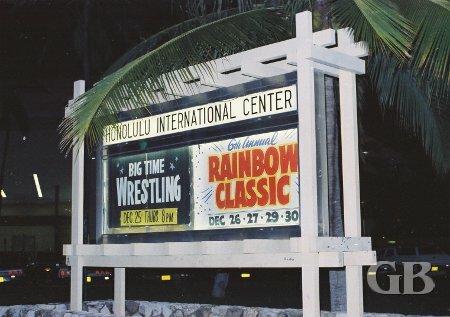 ON the annual Christmas card at the Honolulu INternational Center in 71, BAREND will team with ED FRANCIS to battle SWEET DADDY SIKI and MADDOG MAYNE in a Double tag team stretcher match, in which both members of each team must be carried out on a stretcher with the remaining team or left standing in the ring. Before other sellout crowd FRANCIS and BAREND come out on top. 1972 brought big changes in professional wrestling in Hawaii. The Civic Auditorium was owned by the Royal Development Co. which sold the Civic Auditorium and the land it stood on to American Security Properties (American Security Bank) in November 1971. The new owners decided to shut the operations of the Civic auditorium down in March 1972. The last card promoted at the Civic auditorium was on March 11, 1972 which featured a main event for the Hawaiian Tag team championship in a steel cage between champions SWEET DADDY SIKI and MADDOG MAYNE losing their title to JOHNNY BAREND and SAM STEAMBOAT. The undercard features JIMMY SNUKA winning on disqualification over SUPERSTAR BILLY GRAHAM. With the closing of wrestling operations at the Civic Auditorium, ED FRANCIS had no place to promote weekly wrestling cards in Hawaii. This changed the format of how FRANCIS promoted wrestling in Hawaii for the next two years. With no weekly cards to film matches for TV: both wrestling from the Civil and 50th State Big time wrestling were canceled by KGMB tv. At first FRANCIS used a show called "The Squared Circle" which aired on Friday nights on KGMB to promote his upcoming wrestling cards. This show was the tv format for the remainder of the year. Starting in April 1972 FRANCIS starting promoting monthly wrestling cards at the Honolulu International Center which was owned by the City of Honolulu. Management at the Honolulu International Center limited wrestling programs to once or sometimes twice a month. In order to fill up the arena which could house 8,700 fans for wrestling, FRANCIS had to fly in big name wrestlers from the mainland. Through out 1972 fans were treated to BO BO BRAZIL, FREDDIE BLASSIE, HAYSTACKS CALHOUN, GENE KINISKI, DORY FUNK defending his World title. One wrestler who remained over was JOHNNY BAREND who appeared on all of the monthly cards till Oct. of 72 when an injury forced BAREND to retire from wrestling. IN the fall of 1972. FRANCIS mainly started using AWA talent on his monthly cards. NICK BOCKWINKEL and RAY STEVENS would fly in to defend their AWA World titles every month. The final wrestling card of 1972 held on December 13th featured an All-star card with AWA World Champion VERNE GAGNE retaining his title by defeating CURTIS IAUKEA. Other main event featured an 18-man Texas Battle Royal with Hawaii's own DON MURACO returning to action in Hawaii to win the Battle Royal and $9,000 prize.